Alex Langer is a McGill University political science undergraduate student who designing a wargame of the current Syrian civil war as a course project. He’ll be posting his ideas on PAXsims from time to time as a sort of “developer diary.” You can access all of the parts of the series here. What a ride it’s been! 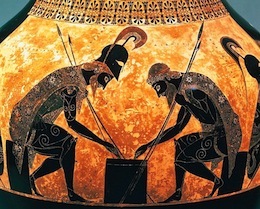 I started this semester knowing almost nothing about game design, and now I think about games –other peoples’ games, Road to Damascus, and ideas for new political science problems to simulate– all the time. Making Road to Damascus has been an amazing experience, in many ways the highlight of my four years at McGill. I’d like to thank Professor Brynen for the opportunity to work on this project, as well as endless guidance and enthusiasm. I’d also like to thank all of the playtesters (Tom, June, Eric, Ecem, Jason, Vanessa, and others) who volunteered their time and energy to work through this game with me. With term coming to an end this will be my final post about my game. I will go through our second playtest, discussing some of the tweaked game mechanics and what still needs to be perfected. 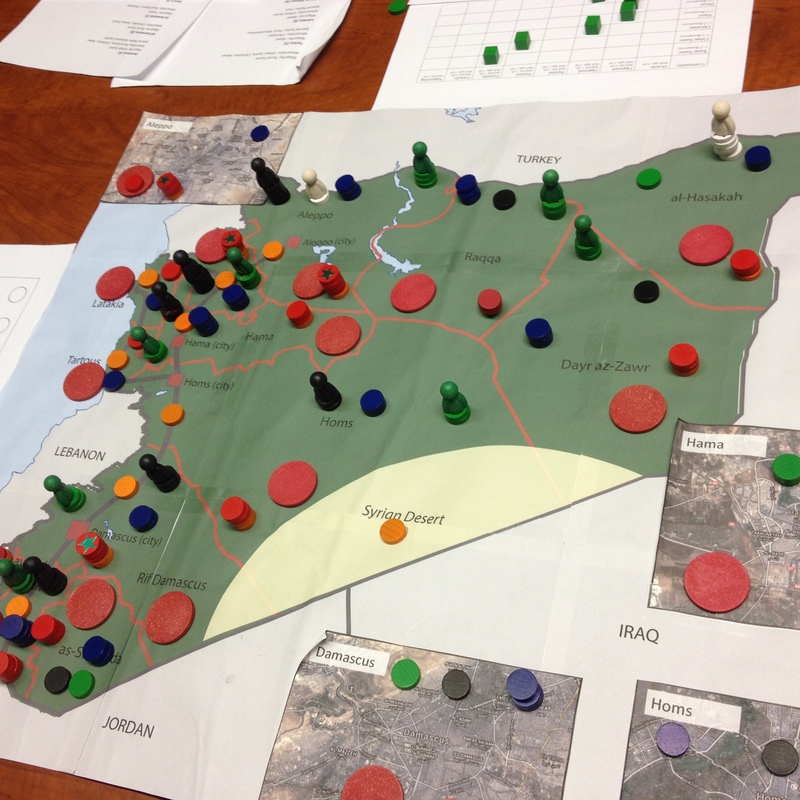 Then, I will talk about how my game ‘fits’ the Syrian conflict as a simulation and possibly as a learning tool. We held another playtest last Friday, which went well. The rule changes from last time had been implemented, and a new map made things much easier to see. While due to my own errors the player aid cards were distinctly unhelpful, the game still ran fairly smoothly. Early in the game. Kurdish nationalists (white) are building up in strength al-Hasakah, the nucleus of what they hope will be their future autonomous area or independent state. Later they will forge very close relations with the Kurdish Regional Government in Iraq, allowing them to recruit from among refugees there. The FSA and Islamic Front initially focus on Aleppo, Idlib, and Hama. The game started with a regime offensive, supported by airstrikes, which cleared out the city of Aleppo and degraded rebel capacity in the surrounding province. In the face of a major government buildup, rebel players withdrew or were wiped out. Heavy fighting there and in Idlib province, combined with harsh winter weather, cause immense damage and forced tens of thousands of Syrians across the border into Turkey. This was represented by Refugee counters, which now appear in neighbouring countries when Death and Destruction occurs are placed in border provinces. These countries become ‘playable’ spaces for Rebel factions with Supporting relations, enabling rebel commanders to slip across the border and recruit an army among the refugees, as each Refugee counter counts as an independent rebel unit. 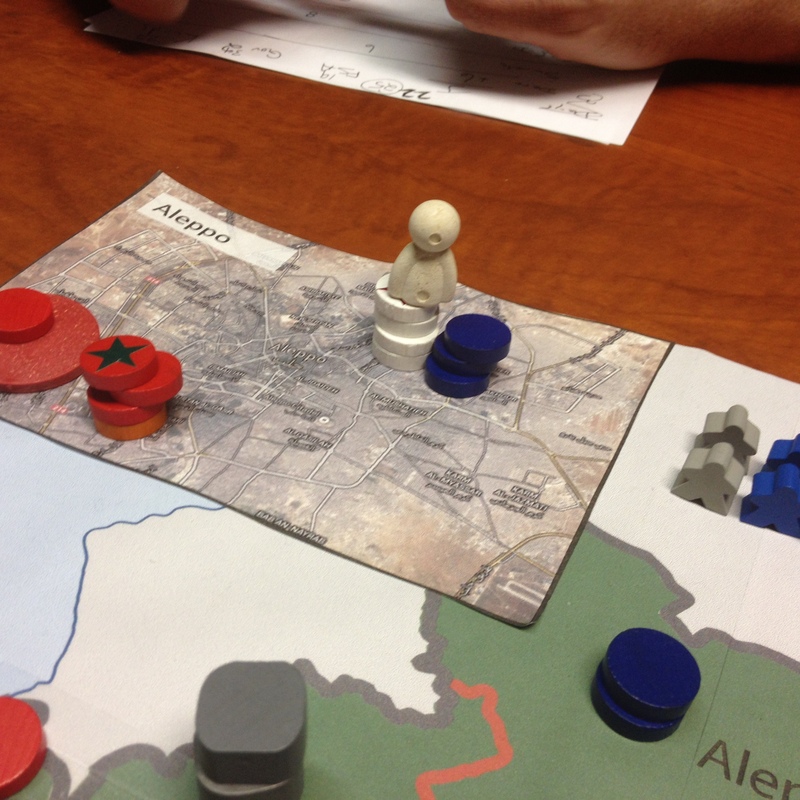 Unlike in our first playtest, the rebel players –particularly the Kurdish Nationalists- made an effort to court international and domestic actors for support; this was made easier by the reduced threshold necessary to change opinion. Mobilization of Syria’s Kurds against the regime caused the quiet emergence of a large rebel force in Aleppo, which had major impacts later in the game. By contrast, repeated regime attempts to court Sunnis failed; had they succeeded, the opposition would have rapidly begun to run out of forces. Initially, it appeared as though the regime was headed for victory: rebel forces controlled a number of provinces, particularly in the northeast, but remained weak in the most populated and important areas near Damascus and Aleppo. A new Revolution! card, “Geneva Conference”, allowed the government to manipulate peace talks (which prevented fighting without paying a price in international support) to steady itself, then mount an air campaign to reduce rebel forces in Hama. Eventually though, as an alliance between the FSA and Islamic Front was struck, the tide began to turn. Syrian forces lost control over Idlib, then Homs province. Indoctrinated and heavily armed FSA forces advanced south into Rif Damascus, while Islamist guerrillas cut the main highway in Homs province. This prevented the capital from being reinforced by troops from Aleppo, leaving Damascus to fend for itself. As the regime lost control over the capital city itself, the desperate Government player unleashed chemical weapons, slaughtering rebel forces but depopulating the country’s most valuable city. Islamist forces soon arrived in Rif Damascus, reinforcing the rebel offensive. The Syrian Army (red), led by the elite Presidential Guard (star) and supported by National Defence Force militias (orange, yellow) have regained control of Damascus—but at the cost of considerable collateral damage (grey rubble). As the game drew to a close though, the most dramatic events were about to occur. The FSA and Islamic Front, quiet in the country’s south until now, marched in and seized control, recruiting independent rebel forces to consolidate their power. Rebel forces marched over the mountains into the Alawi-dominated coastal strip, taking advantage of weak government preparation. In the north, Kurdish forces, planning for months and recruiting Kurdish refugees from Iraqi Kurdistan, mounted a lighting assault into the city of Aleppo. There, they recruited independent rebel brigades and seized control of the country’s now-largest city, raising the Kurdish Rising Sun banner from the captured city hall. With this final move, the Kurdish Nationalists –due to their bonuses for controlling territories with Kurdish populations and a victory points card for ‘Kurdish Self-Rule’, won the game. Famed commander Vanessa leads Kurdish forces and local allies in Aleppo to challenge the regime garrison there. A growing number of refugees can be seen over the border in Turkey. I believe that Road to Damascus, while stylized and simplified, fits the dynamics of the Syrian Civil War quite well. It captures the messiness, grinding attrition and sudden bursts of activity that characterize the war. Combat tends to take the form of harassment and ambushes from rebels, with the government relying on airstrikes and shifting their capable combat units from province to province to mop up rebel fighters. Combat also realistically produces immense destruction: multiple players over both playtests referenced the much-mocked Vietnam War saying, “We had to destroy the village to save it.” The tragic nature of the Syrian Civil War, with regime and rebel forces fighting over a devastated, broken and partially depopulated land, was sadly (but accurately) reproduced by the game. 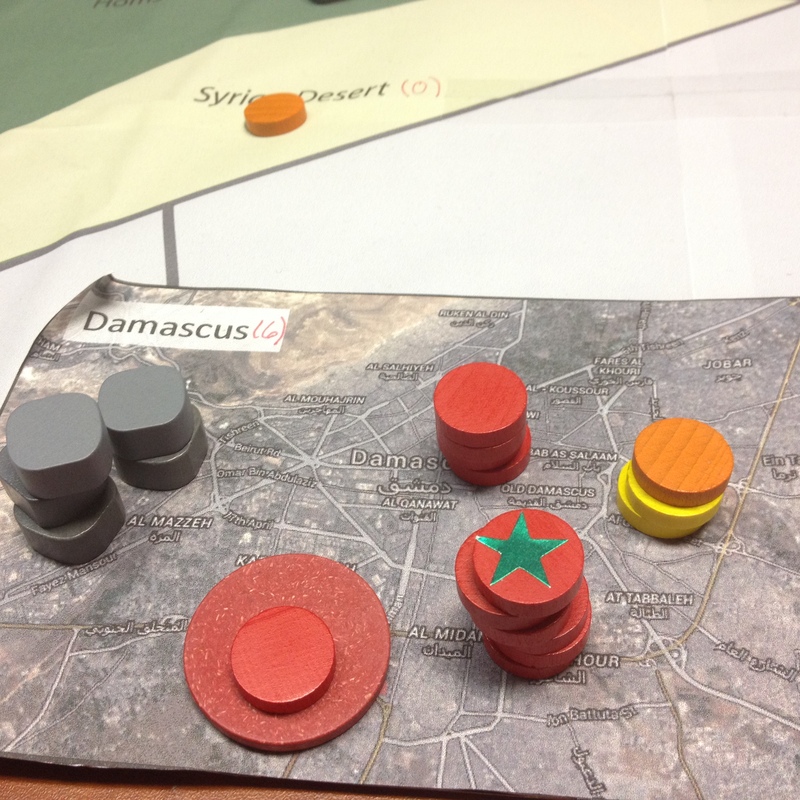 Road to Damascus also effectively simulates the struggles that both sides in the war face. Diplomacy, both with the Syrian people and the international community, is difficult. In both playtests, rebel players struggled to mobilize the population against the regime, while the regime struggled to convince Sunnis to side with the Ba’ath Party and Assad family. The FSA twice gained the momentary support of the Western Powers in the second playtest, before the West lost interest in its cause due to atrocities by rebel fighters or the beginning of a crisis in Ukraine. The frustration with these events was palpable from the FSA player. All rebel players grew to fear airstrikes, dreading the government turn. Meanwhile, the government player appeared beleaguered and complained of feeling under siege. While putting someone in the place of Bashar al-Assad or Abu-Bakr al-Baghdadi may have ethical consequences, the psychological dynamics of the game, with its grinding warfare and constant shortage of military resources on all sides, seemed to work well. While Road to Damascus works well as a simulation of the conflict, there are likely some issues of its use as a learning tool. First are the ethical ramifications of simulating an ongoing conflict. While I have enjoyed this project, I recognize that playing a ‘game’ of a war people are currently dying in and suffering through may be seen as in poor taste or unethical. Additionally, while the game simulates the war well, it is built as a simulation and fun wargame first and a learning tool second: there is not a ton of informational content in the game. While it might be useful for people already learning about the war, it is probably not ideal as a tool on its own. In conclusion, Road to Damascus has been a great learning experience, and something I plan to continue working on and perfecting. I hope you have all enjoyed following my journey in gaming the Syrian Civil War. Seriously, this is a very interesting game you have put together. From time to time I have had some of the same qualms as you had in designing games on topics that are still going on (Afghanistan, Ukraine), but if you are dubious about the morality of the exercise, I’ll confirm the whole hobby is in poor taste (but people can find something objectionable in nearly every pastime, so don’t worry about that). Games that are serious in their basic intent have great potential value in helping people to understand the issues and dynamics of conflicts past or current; they are teaching tools, and if the players have a bit of fun on the way to Damascus, that does not diminish the fact that they are learning. Another interesting kind of COIN simulation. Just a few thoughts vis a vis the Kurdish representation: I’m not sure “Kurdish Nationalists” is accurate in Syrian context, maybe best called SDF? The democratic confederalism of the PYD/TEV-DEM is quite explicitly anti-nation state and they emphasize a decentralized, autonomous pluralism so much that they renamed Rojava to the “Democratic Federation of Northern Syria.” Self-rule, autonomous federalism, etc. are much different concepts than ethno-nationalism. Close ties with the KRG as an event or game mechanic also seem quite implausible in part for this reason. The nationalist and more right wing Kurdish parties in Rojava, those closer to the KRG, have been at odds with the PYD. KRG has had a close economic and political relationship with Turkey (which of course hates the PYD), an essentially antagonistic relationship with the PKK, and has participated in the embargo of Rojava. The KRG has arrested internationals going to fight or participate as activists in Rojava. They’ve even had stand offs in Iraq’s Sinjar/Shingal over “Democratic Confederalist” militia and governance there versus KRG or Iraqi army and political structures. It’s hard to imagine a possible scenario in which the two Kurdish political movements would actually be working closely in tandem. Great comments! I would argue the PYD is very much Kurdish nationalist—it’s the very foundation of their appeal. True, they dress it up in federal-confederal trappings, but that’s quite common for nationalist groups (and, I would argue, it’s partly a framing demanded by geopolitical circumstances, since explicitly secessionist aims would complicate relations with the US, Syria, the Syrian opposition and others). More to the point, it’s a level of detail inappropriate to this kind of game design: if one were to model the intricate nuances of Kurdish politics, one would have to do the same for other ideological currents as well and playability would soon be overwhelmed by complexity. As for relations with the KRG, those were by no means preordained in 2011 on either side. The game does not assume good relations with the KRG, it simply makes it available as an option a Kurdish player can try to pursue (with no guarantee of success).